It's that time in the garden when there are tons of cucumbers and tomatoes. I personally like the combination of tomato and cucumber hunks tossed with a spoonful of mayo. However, Jeff isn't so fond of it. I save that for my lunch. Last week I made a simple salad of alternating slices of cucumber and tomato drizzled with olive oil and balsamic vinegar - easy and elegant. Paired with a cheese and potato frittata. The acidic salad was a nice balance to the egg and cheese. 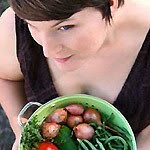 This meal was inspired by Lightly Crunchy's submission to the first Eat Make Grow Blog Hop! 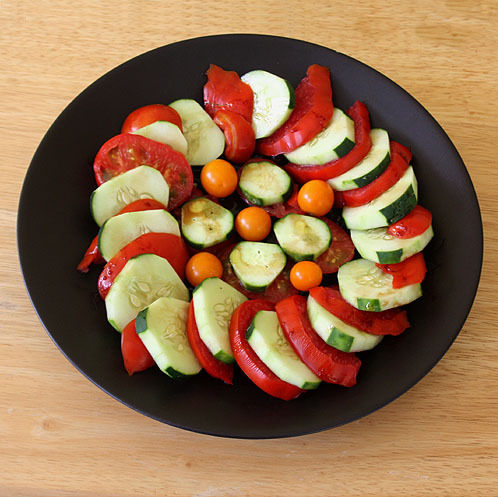 Heidi's cucumber, tomato and basil salad has a couple more ingredients. It sounds like she's harvesting the same things we are! This is a wonderful seasonal salad. Give it a try if you have an abundance in your garden! Wash your produce and if the cucumber has tough skin peel about 1/3 of it off. 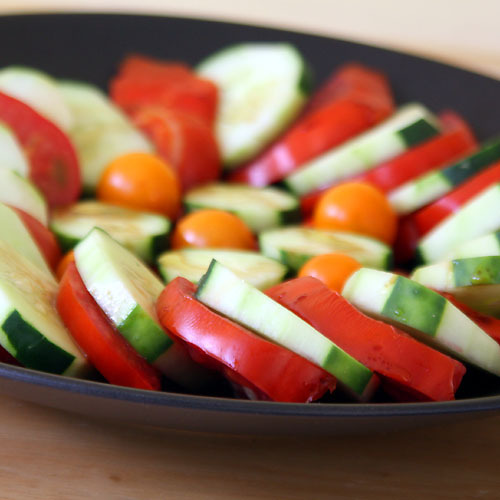 Then slice the cucumber and tomato into 1/2 inch thick slices. In a small bowl whisk together the olive oil and balsamic vinegar. Drizzle over the tomatoes and cucumbers. Add a little salt and pepper to your taste and your done! You can make this recipe a couple hours ahead of you want. The balsamic will be a little more pronounced.